Four-color process printed on Side 1 of 14pt C2S Semi-Gloss stock. Coated with High Gloss UV. Color branding is key to Habitat Technologies, a company dedicated to incorporating the most modern technology into its "smart buildings." 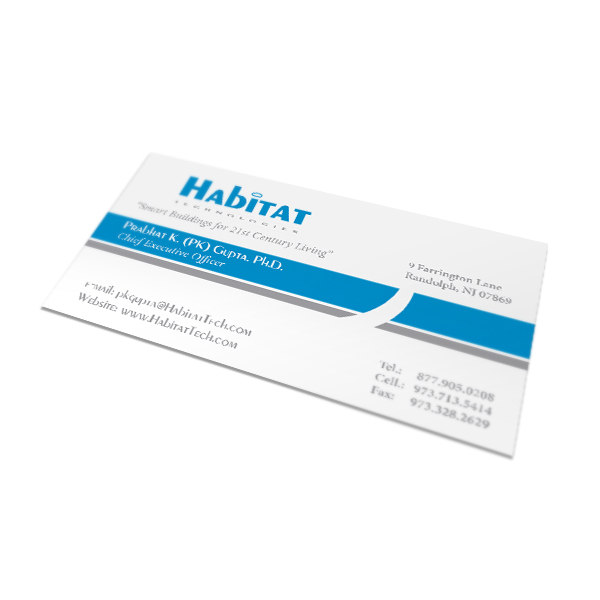 The central stripe and the word "Habitat" are printed in the same blue to connect the two. Gray type maintains a light, calm look, while a gray line underscores the stripe. A white curve cuts the lines in two, creating a gap that unites the information on the top of the card with the information at the bottom. Tiny butterflies resting on Moda Repeat's logo, a flower's petals peeking out of the corner, and a decorative pattern bordering the design bring a playful, girly element to the high-end resale boutique. One side of the card displays the brand's logo and tagline, along with a note about its services. Contact information on the reverse side directs customers to the store, where they can purchase fashionable clothing or sell their own gently used items. Four-color process printed on both sides of 14pt C2S White Semi-Gloss stock. Coated with BioPlus UV. 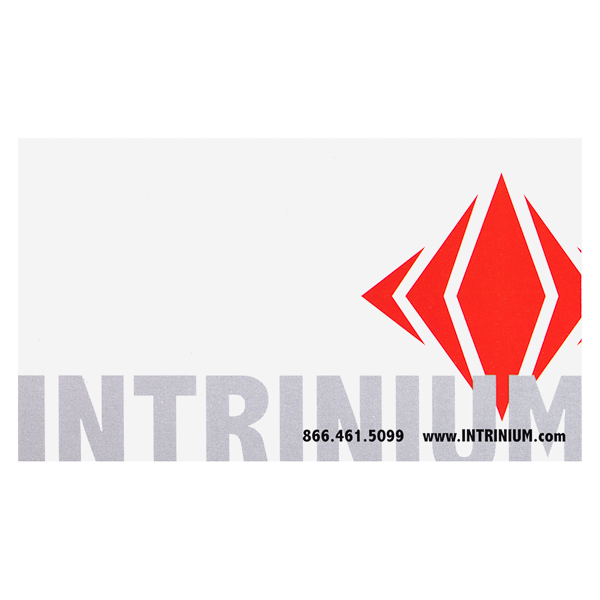 This business card for Intrinium, an IT solutions provider, showcases contact information for both the company and a single employee. The red diamond logo draws attention to the phone number and URL on the white cover. The reverse side is black for immediate contrast. White text and red accents create a sharp look for the individual employee's contact information, while a curved line sets his certifications apart so clients can see them clearly. 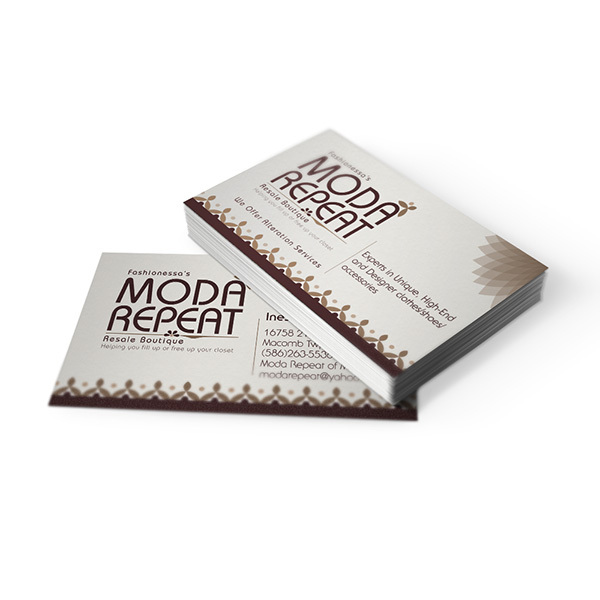 A mahogany border is printed to mimic wood grain, while the tan background has a slight leather effect to give this business card for Pane's Restaurant the illusion of texture. Its homey colors evoke a sense of nostalgia and warmth. The green, red, and white logo hints at Pane's fare—its colors mimic the Italian flag. Contact information on the front lets guests learn more about the restaurant, while the tagline on back stands alone. Its green text ties in the color branding from the front of the card for a consistent design. You only have one chance to make a first impression—with this product, you can make sure it's a good one. Availability in portrait or landscape orientation gives you the power to choose the layout that puts your brand's best foot forward. Digital four-color process printing delivers crisp images and wider color variety, creating a stunning design and offering a cost-effective solution for projects with a tight deadline. Dimension Closed: 3 1/2" x 2"